My alarm clock sounds at 7:30 am and I hit snooze three times. Okay, I say to my cell phone. I’m getting up. I set up my tripod and attach the camera. Then I go into my closet and grab a long, red-sequinned ball gown I have tucked in the back. I call it my Jessica Rabbit dress. I bought it months ago and I’ve never worn it. “Where am I ever going to wear this?” I asked Sam after I forked over $300 dollars. Well, I’m going to wear it now. I switch the timer on for my last self-portrait of my project and grin into the lens. Flayla comes sniffing into the room and sticks her bum in the view of the camera just as I hear the flash. I believe the She-Devil just photobombed or, ahem, photo-bummed my picture. I reset the camera. She licks my face. When I respond, she starts to roll around on the ground, motioning that she wants to wrestle. Oh, what the heck. I crouch down on all fours and begin to play with her. 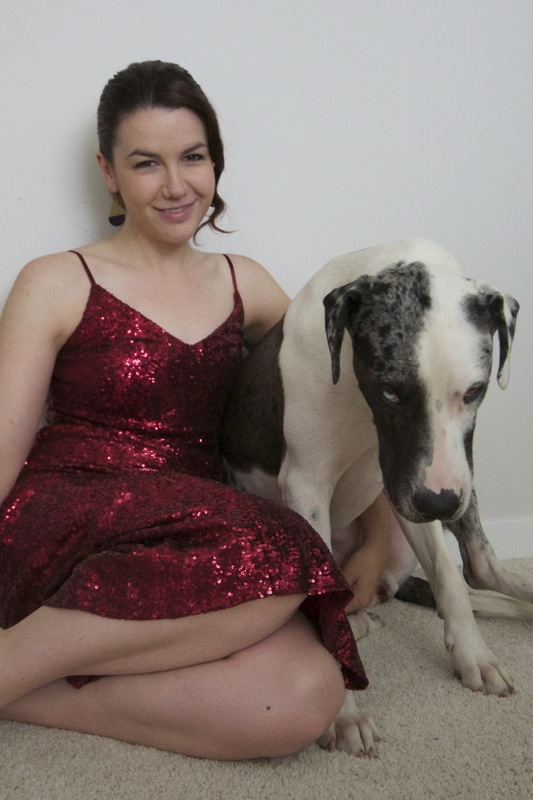 I’m wearing the nicest dress I’ve ever owned and I’m wrestling with my dog on the ground. Flayla is appreciative though. She sticks out her tongue to give me a big, slobbery kiss across the whole of my face. The timer for the camera goes off. That’s it. That’s my last selfie. My project ends with me in a nice dress, an autonomous woman, receiving a whole lot of puppy love. Posted in Puppy LoveBookmark the permalink.